Castle House boasts two character cottages both contained within grounds surrounded by the historic town walls. 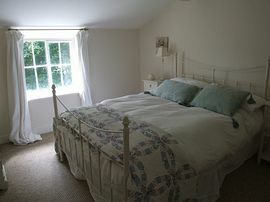 This romantic 2 bedroomed cottage (with lounge that with sofa bed makes 3 bed rooms) has country style furnishings. Spread over 3 floors, the lower floor has Bedroom 2 (twin beds), with modern ensuite bathroom with shower. The middle floor has kitchen, Dining (seating for 6) and Lounge. The upper floor has Bedroom 1, a double, with bathroom next door. 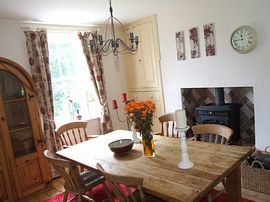 Full gas central heating wood burning stove in dining room (free supply of logs) makes this a romantic hideaway for a couple or a comfortable base for exploring for a party of up to Six. Being 90 metres from the main house, there is the option of taking meals (including breakfasts) at the main house, please apply for details. Part of the cottage is actually built in the ancient Town walls c1287, this place is steeped in heritage! 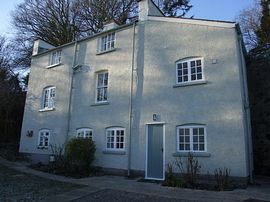 Leicester's Cottage - 2 Bedroom Self-contained Cottage. This spacious cottage which shares its back wall with the Cathedral (built 1587), is situated 70 yards from the main house. 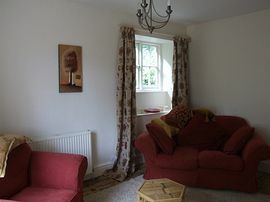 Tastefully furnished, spacious Leicester�s Cottage makes an ideal place to stay from a one night escape to a long stay holiday. 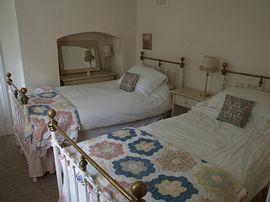 Breakfast can be taken in the main house, or a continental breakfast can be delivered to the cottage. Entrance porch, large kitchen, lounge with wood burning stove (unlimited supply of fire wood provided) 2 bedrooms and a modern refurbished luxury bathroom. Town Walls, Leicester's Church, Castle. Great dog walking from the doorstep into 9 acres of ancient woodlad, and well beyond! Private garden with BBQ + Patio, lawn, views and use of castle House main landscaped gardes, complete with ruins of Leicester's Church and ancient Town Walls. Local Services: Pubs, Restraunts, post Office and Banks, supermarkets all 5 minutes walk away, yet the idyllic position of this cottage on edge of town with views under the lee of the castle makes it feel like it is a remote country retreat! Proceed for 1 mile (views of Castle House and Castle on your right along this road) to staggered crossroads, take right turn to Denbigh, down and up river valley, past old (disused) Hospital, to slanted T junction, turn right, and after 50 yards turn right into driveway to Castle House, proceed along tree lined drive for 1/2 mile to enter Castle House. We are NEW and as yet ungraded, we expect 4* grading.